The new tax law is a game changer for taxpayers. There are several things to consider, whether you’re making a small gift or willing your entire estate. The Tax Cuts and Jobs Act makes it harder for many average Americans to claim the tax deduction for charitable contributions. Although the deduction for donations hasn’t changed, you must itemize to be eligible to claim it, and the bar has gotten higher. 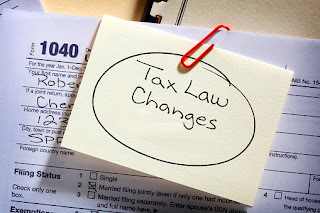 The new law eliminates the personal exemption, but standard deduction amounts for 2018 will increase substantially to $12,000 for individuals, $18,000 for heads of household, and $24,000 for married couples filing jointly and surviving spouses. An additional standard deduction of $1,300 for the aged (65 and older) or the blind also applies. Mortgage interest. Beginning with loans originated on 12/15/17, you can only deduct the interest associated with up to $750,000 mortgage debt, down from $1 million. Older loans are grandfathered in. Home equity loan interest is no longer deductible. State and local taxes. Sales, real estate and income taxes have lost their full deductibility. They are now subject to a $10,000 cap on any combination of state and local taxes. Charitable giving. There are no major changes to charitable giving rules, although it’s now more difficult for the majority of tax filers to claim a charitable gift deduction, as outlined in this article. Medical and dental costs. The adjusted gross income (AGI) threshold was lowered for 2017 and 2018, when itemizers can claim unreimbursed eligible medical expenses that exceed 7.5 percent. The threshold climbs back to 10 percent in 2019. While the personal exemption has disappeared, the higher new standard deduction will make a tough hurdle to clear for many taxpayers. A recent congressional report anticipates the new law will cut in half the number of homeowners using the mortgage deduction, from 32.3 million in 2017 to an estimated 13.8 million in 2018. Similarly, the number of homeowners who itemize is expected to drop from 46.5 million last year to 18 million in 2018. For those able to itemize, donations to charity have minor changes. Cash gifts are now deductible up to 60 percent of gross income (previously 50 percent), and gifts of stock remain deductible at up to 30 percent of income. You may still use charitable deductions for up to six years before they are lost. The way you evaluate a charity is likely all wrong. Take it from Dan Pallotta, who raised $108 million for HIV/AIDS research, and another $194 million to fight breast cancer. After bad press about how much money was spent on overhead to put on their cycling and walking events, his organization closed its doors. Pallotta says the way we’ve been taught to think about charity is dangerously unhelpful, particularly the use of a single yardstick—overhead expenditures—as the sole or most important evaluator. Pallotta advocates that you think of yourself as a philanthropist, no matter the size of your donation. Over time, your small gifts will make an impact. Begin with a cause you want to influence, and find out who is doing the best work on that problem. Start with a broad search and narrow it from there, Pallotta advises. You can use websites like GreatNonprofits.org, Philanthropedia and GiveWell.org to begin your search. Use them, he says, but don’t rely on them. Interview your top two or three candidates. Call and ask for a tour or meeting; development departments exist to build donor relations. Ask what progress the charity is making toward its goals, and what metrics it uses to measure that progress. But if the problem it’s attempting to solve is big and difficult, consider Jonas Salk a year before he discovered the polio vaccine: dreaming big, but empty-handed. “Overall, for each charity I give to, I ask myself if I believe in their business model and if I feel they have a bold future ahead of them,” Pallotta says. There are several tax strategies that may help you continue to benefit from charitable giving, even if you can’t itemize. Certain strategies keep income off your return, allow you to itemize periodically or return income to you. Bunching or bundling your itemized deductions. If your qualified donations over a year don’t put you over the standard deduction bar, try giving double that amount every other year. This may be enough to put you over the limit for itemizing every other year. Gifts that provide income. You may wish to make a charitable donation while you still need income. A charitable gift annuity or charitable remainder trust may be a good solution. These gifts require more substantial funding, which may allow you to itemize in the year they’re created. However, only a portion of the contribution is deductible since you will receive income for years or throughout your lifetime. Such a gift may be funded with cash, real estate or stock. Choosing the right assets to give. Which assets you donate can be very important. During your lifetime, consider giving highly appreciated assets such as stock. You’ll avoid taking a tax hit for capital gains on the appreciation, while still claiming the full value of the assets as a charitable contribution. Such gifts can also be used to fund a charitable gift annuity or charitable remainder trust, and will postpone the recognition of the capital gain, which may generally then be paid in smaller amounts over several year. Donor-advised funds. This method allows you to contribute a large sum in one tax year to create or add to an existing donor-advised fund. That may enable you to itemize if the gift is big enough. In years where you’re unable to itemize, you can ask the fund administrator to make charitable distributions. Donor-advised funds don’t cost a lot to establish and maintain. You can find out more about them by contacting a charity you wish to assist, or through financial services firms that administer the funds, such as Fidelity or Schwab. Charitable rollovers or qualified charitable distributions. If you are 70 ½ or older and take required minimum distributions (RMDs) from one or more retirement accounts, you can ask the plan administrator to make a distribution directly to a charity. The distribution won’t be added to your taxable income, but you also won’t receive a deduction for a charitable contribution. The charity gets more, because the money isn’t taxed; you don’t lose if you couldn’t itemize that year anyway. Estate gifts: charitable bequests and beneficiaries. Charitable gifts upon death can impact the causes you support. There are many ways to gift part of your estate to a cause. They include: creating an extra share for charity, bequeathing a specific dollar amount or item of property to charity, and designating a percentage of your estate to charity by naming it as the full or partial beneficiary of a life insurance policy, bank account, investment account or any account that transfers by beneficiary designation. Listing a charity as the beneficiary of a traditional IRA account, which can be broken into several smaller accounts for convenience, passes the money to the charity tax-free. Heirs must pay tax on these inherited accounts. Wealthy taxpayers can benefit from a nearly doubled lifetime estate and gift tax exemption. It went up from 5.49 million per person last year to an estimated $11.2 million, with inflation adjusted for future years. Double those numbers for married couples filing jointly. Disclaimer: The information here has been condensed from several sources. It is not meant to be construed as tax, investment, financial planning or legal advice. Please consult with your personal advisors before making any charitable giving decisions.